ATLANTA—Special Agent in Charge David J. LeValley, FBI Atlanta Field Office, alongwith Acting Administrator Timothy Horne, General Services Administration (GSA), and Principal Claiborne Williams, FD Stonewater, announce the completion and transfer to the FBI of its new state-of-the-art, 151,066 square foot law enforcement facility that will serve as home to the FBI Atlanta Field Office at 3000 Flowers Road S., Atlanta, Georgia 30341, located on the Mercer University Atlanta Campus. 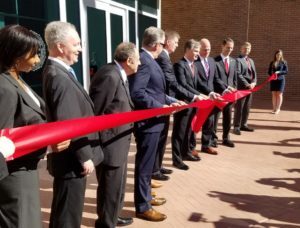 Earlier today, FBI Director Christopher Wray presided over ribbon cutting ceremonies that included Acting Administrator Timothy Horne, GSA, along with Principal Claiborne Williams, FD Stonewater. Also in attendance were numerous local, state, and other federal law enforcement executives and their command staff. Headquartered in Arlington, Virginia, FD Stonewater is a real estate development, investment, and brokerage firm with national capabilities. In the fall of 2015, FD Stonewater was awarded the contract by GSA for the development of a build-to-suit facility for the FBI in Atlanta, Georgia, with construction commencing in early 2016. 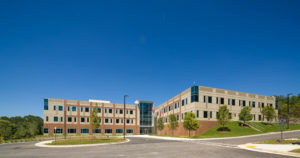 Powers Brown Architecture was the lead designer for the project and Harvey Cleary Builders served as general contractor.